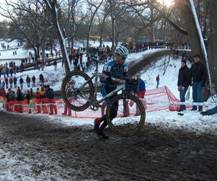 For three days in December the beautiful Roger Williams Park in Rhode Island , U.S.A. hosted the Liberty Mutual U.S. National Cyclo-cross Championships. Over 25 championships were contested ranging from 10-year old girls and boys to 60+ Masters. 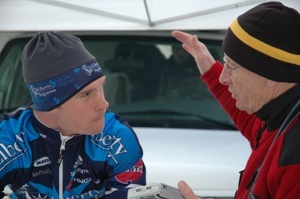 In all about 1700 athletes from all over the country swept into Cyclo Cross crazy New England. At the best of times the weather in this part of the country can be fickle. On day one (December 9 th ) Mother Nature produced weather that even had the cyclo cross die-hards diving for cover. A raging snow storm, hurricane force winds and white out conditions forced the organizers to postpone two races to the next day. Once the storm had blown through most of the race tents, track side hoardings and marker tapes had been flattened or simply blown into the nearby ice crusted lake. Next day crews were up at 4:00AM to rebuild the circuit infrastructure. Now blanketed in a beautiful layer of snow the races for the second and third day were held under mostly blue skies. However the racers had to deal with changing surface conditions depending on the time of day and position of the sun. From hard ice to a cocktail of melting snow and mud made for mostly very technical conditions. As a result the thousands of spectators were treated to great classic cyclo cross racing. Many race fans are not aware of the fact that the famous Pro Tour Liberty Seguros team is in fact directly linked to Liberty Mutual the insurance company. The company world wide headquarters are in Boston and thanks in large part to Tom Ramey, President of Liberty International, the Liberty group of companies are supportive of cycling within very specific targeted areas. The 2005 and 2006 U.S. National Cyclo Cross Championships are their first venture into major cyclo cross sponsorship and from the comments made by Steve Sullivan, Senior VP Communications for the Liberty Mutual Group, North America, at the awards ceremony, the company is extremely happy with the organization, participation and huge spectator support. In particular Steve noted the enthusiasm and dynamic nature of a sport conducted in very challenging conditions of weather and terrain. In addition to sponsoring the championships, Liberty Mutual also sponsored defending national champion Jonathan Page and he appeared in the familiar jersey associated with the Liberty Seguros pro team. While much media focus was on the elite Women's and Men's races the real heart of this sport lies with the youngsters from 10 to U 23. There was a huge turn-out of youngsters of both sexes to contest age related championships and this gives great hope for the future of our sport. Most of these riders can be seen throughout the year riding on the road. To see them taking on often frigid and very technical conditions is a joy to behold. At the other end of the scale we saw 60+ Masters tackling the same circuits and we can hope that many of the youngsters seen racing in Rhode Island will still be with the sport when they become ‘Masters'. Cyclo Cross is a very intimate sport in which spectators and racers merge into one colorful mass. Before and after the race everyone mingles together. During the race the riders (as they did here) become very cold and coated in mud. The spectators are just inches from the action and will themselves become spattered with mud and get almost as cold as the racers. The stars will try and find a quiet corner to do their pre-race warm up on the turbo trainer but usually you can wander up to them and sense the feel of anticipation and nervousness at the impending big race. No matter who is getting ready it is good to see that everyone respects the riders and let them prepare without fuss. Before, during and after the race, possibly the toughest and least recognized participants of the whole show are the team mechanics. My favorite sight was to see one mechanic in his brown workshop coveralls stroll down to the lake, smash open a hole in the ice and then dunk a mud encrusted bike in the water and then clean it. Back up in the pits shiny bikes were always ready for the riders as others bearing the scars of battle were washed off either in the lake, by hose or simply with a bucket of water. Doing this work all day in sub-zero conditions takes great fortitude. Graham Jones:Thank you for speaking with us. Let's start with your experience of racing in Europe . To what do you attribute the different level of racing between us (in the US ) and the Belgians and Dutch? Jonathan Page: I think that they have been doing for so long that now it is based on a tradition that has evolved into a well oiled machine. G.J. Are they more intense about their racing? J.P. Yes, and they really know how to prepare and work hard. G.J. A big difference seems to be the support structure behind each rider. They have their whole family behind them. J.P. All that and of course their fanatical supporters clubs. G.J. So how do you feel racing in this environment knowing that they have all of this support structure and you are basically on your own? J.P. Well, it was very hard at first. Now I have slowly integrated into the whole thing and today I now have my own little supporters club. G.J. Are you going back to Belgium after Christmas? J.P. Actually, before Christmas to be ready for the big holiday races. My plan is to stay there until the end of February, just after the World Championships. G.J. Your season seems to be 12 months long . What is your favorite, road or cross? J.P. I like them both. G.J. How do you rate the conditions today? J.P. Perfect. A very nice mix of ice, snow and mud. G.J. So we have two ‘icemen' here today – you and Tim. G.J. Who are the big contenders for the championship today? J.P. Tim (Johnson) is technically excellent; Ryan (Trebon) is strong but not so technically adept as Tim; naturally Mark (McCormack) and the others will rise to the occasion. G.J. You are basically racing a 12-month season. How do you manage your peaks and valleys? J.P. Obviously this race is big. G.J. Last year you won the prestigious Fitchburg/Longsjo stage race. J.P. Yes, last year I had my best road season ever. However between the cross and road seasons I do try to take a break in the spring time. G.J. Have you ridden the course today? J.P. Yes. It is not unlike the courses in Belgium . The course will be difficult thanks to the snow and several off-camber sections. It is very well designed and I like it. G.J. Well we will let you get ready in peace and wish you a lot of luck with the race. Thank you. G.J. (Standing on the finish line). Jonathan, now that the race is over, you remember our pre-race chat? G.J. How do you feel now? J.P. Same as I felt before (stomach sickness). Not good. Could not go fast today so I had to rely on bike handling skills. Bad timing - s*#t happens - and it did. Naturally Jonathan was upset to have lost his championship. Yet even with his sickness he was able to make it on to the podium in third place behind new champion Todd Wells. However he stayed with his plans and went across to Belgium where he continued to struggle to rid himself of his stomach ailment and regain his form. Finally he got back on top with a great win at Petange, Luxembourg on January 1st. Make www.cyclingrevealed.com your homepage now.